One of the items on the "Baby Stuff Items" list was to hang the mobile. This is a project that's been in the works for maybe a year? 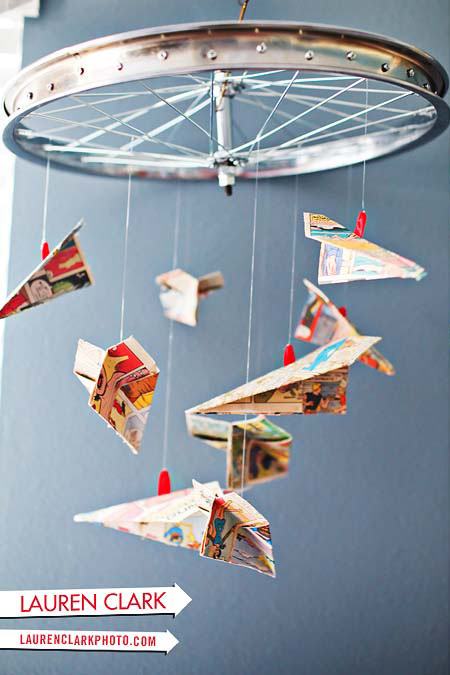 Yes, before I was even pregnant, I found this bicycle mobile online and purchased it right away. I seriously thought I had jinxed us from ever having a baby! Thank goodness it all worked out. Anyway, back to the mobile... it was handmade in Kenya from recycled copper and steel wire. The website that I purchased it from is a Fair Trade store called Global Crafts. According to their website, their mission is to provide artisan crafts from developing countries to mainstream markets. 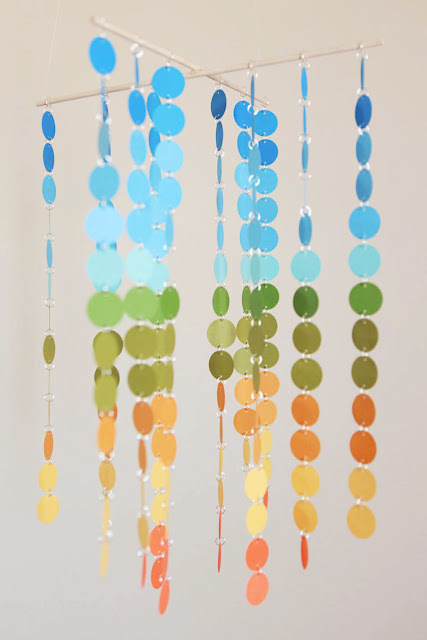 In the meantime, I found a few other mobile ideas on Pinterest that I thought I could combine with the mobile I already had, to create a one-of-a-kind mobile for our little tyke! The first inspiration image was so clever for a bicycle-themed room, that I couldn't resist. I pinned it months ago, and finally made the leap. Originally I had seen it on Apartment Therapy, but the actual creator is Lauren from Lauren Clarks Blog. I found a bicycle wheel on ebay for $9.99 (buy it now price), and then another $10 for shipping. But I was happy to have found it for $20 and went ahead and purchased it. Next up, was another mobile I had pinned a while back from the Etsy shop Lil Sprout Creations (it's being sold for $50). Theirs is pretty elaborate with the silver rings connecting the dots, and the sophisticated bars and spacing, and long flowing strands of color. 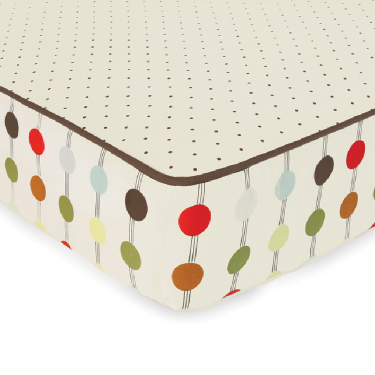 It's called Skip Hop: Mod Dot and it is available at both Babies R' Us and Target, both of which we had registries. It truly incorporates the whole rainbow of colors that I was already thinking for the nursery, so it was perfect! BACK TO THE STORY. The 'mod dots' reminded me of this mobile, so to tie everything together, I thought 'what the heck'... let's do this. I went to Lowe's and discreetly picked up about 24 paint chips, getting varying colors of blue, green, yellow, and red. One thing that I wanted to change was the actual strands, sticking to one color per strand. So a blue strand, a green strand, a yellow strand, and a red strand. I started by trying to figure out how in the world I was going to get perfect circles cut from these chips, and that's when I remembered the oversized hole punch from Stampin' Up that I had from previous projects where I've used the candy cups for party favors, here and here. Lo and behold it was the perfect size for the circles that I needed! See below how I maximized the space allowed on the paint chip cards! Here's a shot of all the circles cut (remember I'll need a front and back for each circle, hence the double rows of each color). And the great thing about the hole punch is that they are all exactly the same size, which is helpful when we get to gluing the back to the front. Next up, how to get these suckers on a mobile. I thought fishing line at first, but I didn't have any fishing line, and since the wire bicycles above were on black thread, I thought it would be nice to do these with black thread as well. After deciding on a length for the rows, I measured out equal spacing between the circles. Then it was time to glue! Once glued, I weighted them down for drying. I can share it with you! So for around $30, I have a completely unique mobile! I love it, and hopefully the baby will too! Thanks Brian for rigging up the hook (which even rotates, by the way)!